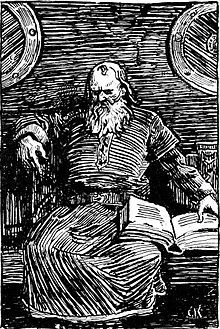 Snorri Sturluson (1179 – 23 September 1241) wis an Icelandic historian, poet, an politeecian. He wis electit twice as a lawspeaker at the Icelandic pairlament, the Althing. He wis the author o the Prose Edda or Younger Edda, which consists o Gylfaginning ("the fuilin o Gylfi"), a narrative o Norse meethology, the Skáldskaparmál, a beuk o poetic leid, an the Háttatal, a leet o verse forms. He wis an aa the author o the Heimskringla, a history o the Norse keengs that begins wi legendary material in Ynglinga saga an muivs through tae early medieval Scandinavie history. For stylistic an methodological reasons, Snorri is eften taken tae be the author o Egil's saga. ↑ The Auld Norse/Icelandic spellin o the name is Snorri Sturluson. Snorri Sturlason is the modren Norse an Snorre Sturlasson the modren Swadish spellin. For the construction o the name (a patronymic), see Icelandic namin conventions. Inglis no langer featurs this teep o name, except as a foreign wird. Anglicisation o Scandinavian names is nae staundart an varies a great deal. Encyclopaedias an dictionaries nearly aw leet Snorri unner his Icelandic name. Beuks an airticles mey uise Snorre Sturleson, Snorri Sturlusson, Snorre Sturlson, Snorri Sturlson, in addeetion tae his Norse an Swadish names. This page wis last eeditit on 6 Apryle 2017, at 20:24.